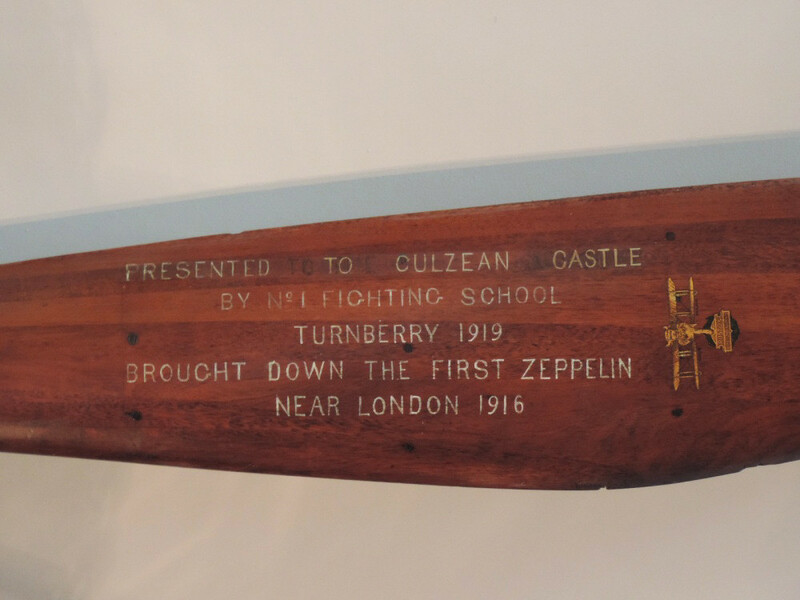 From the ceiling of the Armory at Culzean Castle hangs a propeller which helped the Royal Flying Corps achieve a fundamental victory during the First World War. During their many years at Culzean Castle, the Kennedy family acquired an extensive assortment of memorabilia from all over the world which has embellished the interior – and exterior – of the property ever since. Among the many exotic artifacts and luxurious décor hangs what might seem like an ordinary aircraft propeller. The propeller, however, played a central role during a notable event in modern history. The aerial bombing of cities was begun by Germany during the First World War; from 1915 bombing raids became an everyday – or every night – concern in Britain. The initial incursions in England were carried out by the German Empire’s fleet of airships, the only aircrafts capable at the time of such extended campaigns. Soon the fear of the Zeppelin grew across the country – the previously inconceivable idea of a foreign invasion had become more likely. 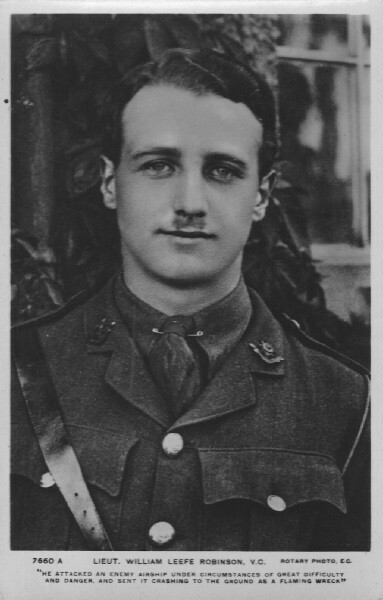 It was in this climate of terror that Lieutenant William Leefe Robinson (1895–1918) joined 39 Squadron, Royal Flying Corps, created in 1916 as a defensive response to German dirigible raids. Robinson had served previously as an observer with the Worcestershire Regiment in France. After he was wounded in Lille, he underwent pilot training in Britain and joined the fight against the enemy airships. In April 1916 Robinson had his first chance of shooting down one of the Zeppelins but did not succeed. However, a second opportunity presented itself later that year, in the early hours of Sunday 3 September. After taking off from Sutton’s Farm in Essex, he sighted a German airship, the wooden-framed Schütte-Lanz SL 11, and attacked it at an altitude of 11,500 ft. Having been hit by rounds of machine-gun fire, the seemingly impregnable airship burst into flames – watched by thousands of cheering Londoners. On landing, Robinson was given a hero’s welcome and the night was dubbed ‘Zepp Sunday’ after his exploits. This was the first German Zeppelin to be destroyed over Britain, and the fear of an indestructible enemy slowly began to fade. In April 1917, Robinson’s Bristol F2a fighter plane was shot down over France and he was captured by the Germans. On account of his famous identity he suffered brutal conditions in the prison camp until his release after the Armistice was declared. However, he had been severely weakened by his time spent in captivity and he did not have the strength to fight off the ferocious influenza epidemic of 1918. At the age of 23 William Leefe Robinson died on New Year’s Eve. One of the nation’s most recognised heroes in the First World War is buried in All Saints’ Churchyard in Harrow Weald, Middlesex. The brass-mounted teak propeller hanging in the Armoury of Culzean Castle is from the converted B.E.2c night fighter in which Robinson flew on 3 September 1916 and struck the decisive blow. The biplane outlived that memorable night but, as happened to several other B.E.2c which all suffered from lack of manoeuvrability, it eventually crashed later that year. Luckily the propeller survived. In 1919 it was presented to Archibald Kennedy, 3rd Marquess of Ailsa, by the No.1 Fighting School as a gesture of gratitude – the Turnberry-based airstrip used by the Fighting School during the war was part of the Kennedys’ landholdings. 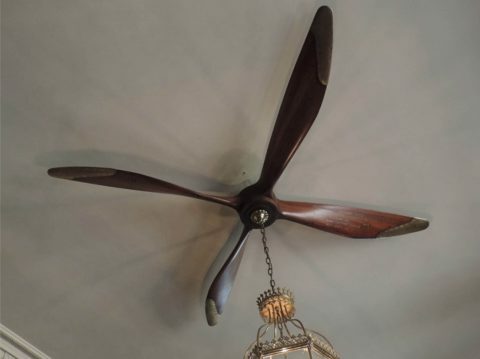 Since then, the propeller has been adapted to adorn the ceiling at Culzean, an enduring memento of the Great War and the role played by William Leefe Robinson. This article is by Alice Maraner, Inventory Officer, Project Reveal South West. Project Reveal is a multi-site digitization project of unprecedented scale. With your support, we can help the Trust manage its collections more effectively. Most important, we can help the Trust discover, better understand, and share its treasures with the world. This article was originally published by the National Trust for Scotland on October 3, 2017.